December is the season beloved for markets and street feastivals, the sagre, featuring the Italian local specialties which diversity is somewhat incredible to discover. Local Food, fun for families and children but also a fantastic opportunity to explore ancient and colourful villages, the beautiful little borghi we all fell in love with at first sight. In Italy, a sagra is a pretty local festival involving food and frequently showing also a historical pageant. The various sagre claim their ancient origins to be traced back to local medieval country fairs or even more ancient celebrations. Let’s check what’s going on this first week of December around the Belpaese! From 2 to 6 December 2015 you will get a taste of this festival tie with tradition: these are the factors that create a Superzampone. The town of Castelnuovo Rangone has held since 1991, the record for the biggest zampone in the world today they got to 942 pounds! Friendship and conviviality are the strong dishes, of course, but there is also the healthy component of the competition: every year is in fact seeking to repeat the previous record of measures knuckle. No coincidence that the idea of ​​producing a huge trotter was born in a country that the pig has even dedicated a monument, placed in the square where about eighty years ago, the pigs were weighed before entering the sausage factory. Even this year’s attempt is to set the record trotter world’s largest, and after baking the delicious sausage will be offered to the public. 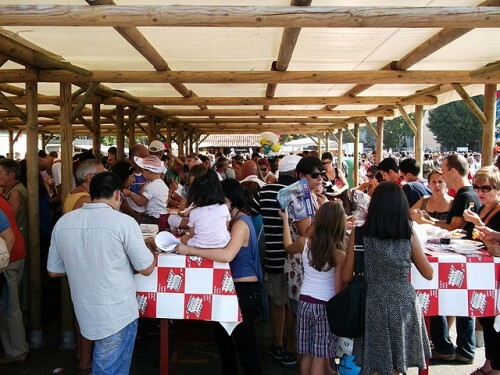 Not only food but also cultural events are organized on Saturday and Sunday excursions to discover the gastronomic treasures and cultural excellence of the territory. Let’s face it, the important thing is to participate to exceed the size of last year. According to tradition, the idea of ​​filling the front leg of pork with spicy minced pork was born to preserve the meat of the pig during a long siege of the city of Ferrara, the beginning of the sixteenth century at the court of Pico della Mirandola, the greatest exponent of Italian philosophical Humanism. Rocca Sinibalda is a tiny hamlet of 836 inhabitants in the province of Rieti, Lazio, dominated by the impressive castle Sforza Cesarini. This pretty village perched on the hills of Lazio at your arrival you will be greeted by the fact queen of the evening: Her Majesty the polenta. Omnivores will accompany the succulent sauce with ribs and pork sausages, while particular attention will be given also to the vegetarian recipe, which allow you to enjoy the goodness of this dish even the most discerning palate. All it served in traditional scifetta wood, accompanied by a good glass of red local wineries, fruit and sweets. From 6 to 8 December 2015 do visit and prepare your taste buds to a healthy ration of good taste because the ancient dish made of corn flour will be cooked following the authentic traditional recipe. Still time to visit National Exhibition of the White Truffle in San Miniato the started on November 14 and ending on December 6 2015. The organisers has certainly stuck its nose in the surrounding nature, to collect his best and tubers and giving them to you all fragrant and tasty. Do not be afraid to make you too nosy and follow the scent of the feast will take you straight in the village of San Miniato. Sniff the delicious local specialty, you can appreciate the unique flavourr of the stands set up for the party. Therefore take part in the many initiatives by intense as the tasting of truffles accompanied by Tuscan wine and oil, appetizers with drinks and snacks truffle aroma and fun challenges including housewives and chefs strokes tagliolino made of fine tuber. And if you thought that truffles were the only culinary surprise, you are mistaken. Among the historic alleys of the village it is in fact set up numerous stands displaying for sale and tasting other local gastronomic delights. Among the temptations that rejoice your taste buds will find the best cheeses, meats, sauces and desserts of the territory. Do not waste any more time and trust your instinct by greedy connoisseurs. If after a fine meal of truffles will have a strange sense of calm and serenity, the answer is soon given. The prized tuber in fact contains a substance called landrosterione that slows the production of serotonin, responsible for regulating mood. The Christmas beers in principle were born to a family consumption, extended to employees of the brewery and friends. Unmistakable taste and designed especially for the Christmas season, these special beers have begun to spread to the most loyal customers of the brewery as a special year-end gift, to the present day, where delight the palates of thousands of visitors each year. If you are also lovers of craft beer not wait any longer and get ready to leave for this charming village in Lombardia. A three days -from 4 to 6 dicember 2015- entirely devoted to beer with more Christmas beers on tap and in bottles from various European countries and especially the Italian craft breweries. On arrival you can sample the best craft beers and accompany them with a wide selection of local produce and themed menus specially designed by local chefs. In short, a unique opportunity that every fan of hops and malt can not miss. Then prepare the mug of great opportunity in the mouth and hops. For the greedy ones we recommend the unmissable stincata with sauerkraut and potato chips. And yet workshops on home brew, conferences and exhibitions. This entry was posted on Wednesday, December 2nd, 2015 at 11:57 pm	and is filed under Events in Italy. You can follow any responses to this entry through the RSS 2.0 feed. You can leave a response, or trackback from your own site.